We’ll show you how to make this Indian curry recipe using authentic Indian spices. 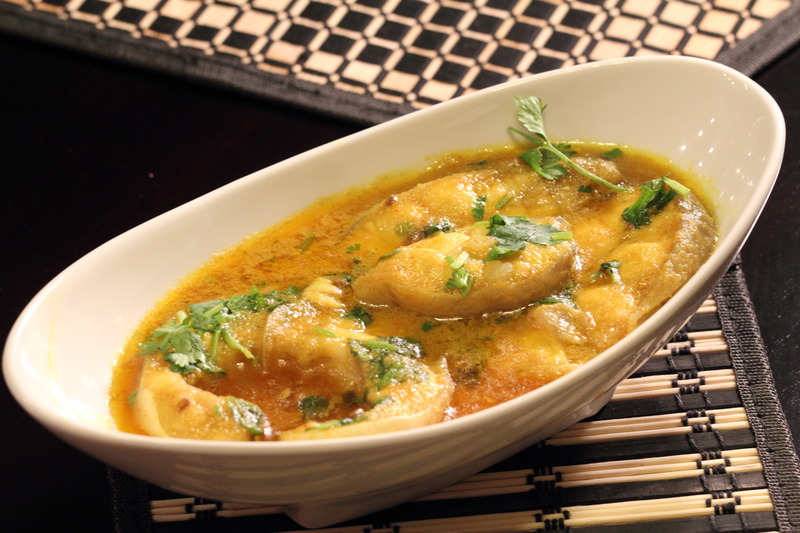 This easy Indian recipe will satisfy seafood lovers and curry lovers alike. Take one full onion and add to blender. Add ½ cup of water to the blender. Blend until both are liquid. Add 6 cloves of the garlic to the blender. Add 1 inch ginger to blender as well. Liquify. Add 1 cup of corn oil to pan. Set stove to medium heat. Add ½ of an onion to pan. Fry for about 4-5 minutes until onions turn golden brown. Avoid burning onions. Add the liquefied blender mix to the pan with the golden brown onions. Add the following: fenugreek seeds, turmeric powder, coriander powder, red chili, and salt. Add 1 cup of water to the pan. Add catfish to the pan. Gently move around the catfish for 10 minutes on medium heat in order to evenly cook. Cover catfish and cook for 7-8 minutes. Check catfish to see if cooked by sticking in fork. If it comes out clear, it is cooked. Uncover catfish and allow water to evaporate. The curry will go from having a watery consistency to having a thick oily consistency. Add a cut up bunch of cilantro to fish. Add lemon juice to dish. Serve with bread (roti, chapati, tortilla) or plain rice. We hope you liked this recipe. Please check out some of our other fish recipes including our Spicy Baked Salmon recipe.